Greetings. 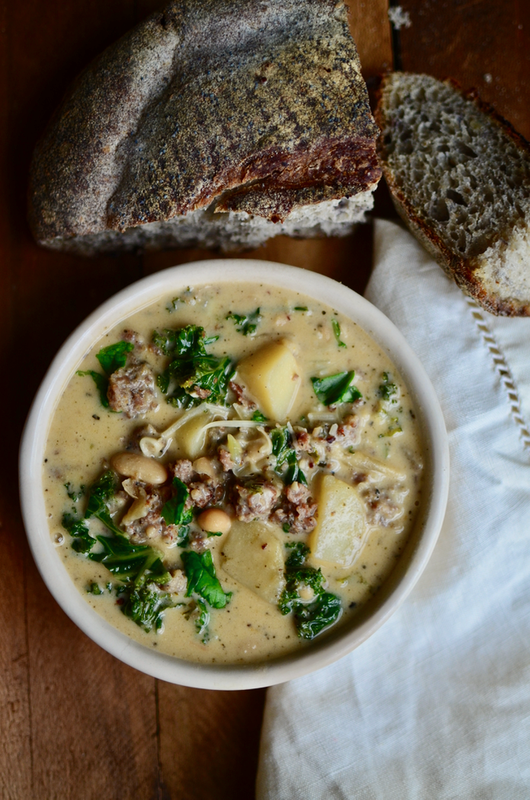 I'm here today to offer up to you my copycat version of Olive Garden's Zuppa Toscana. 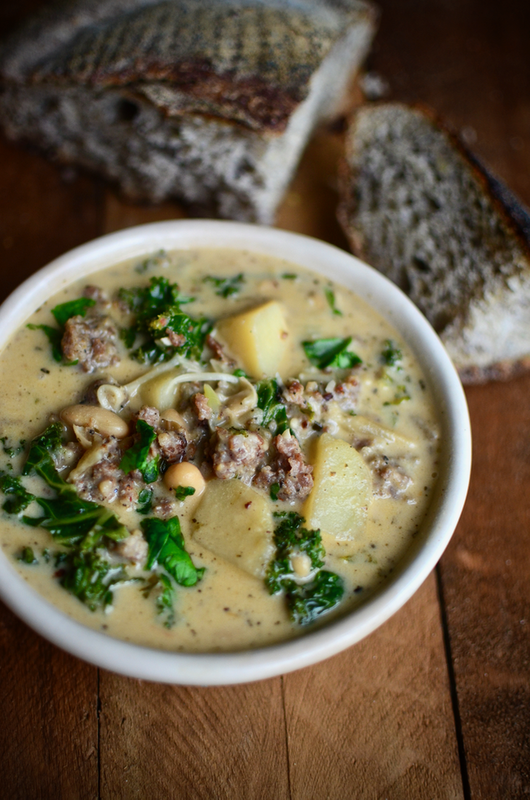 Or maybe I should say a copycat of a copycat of Olive Garden's Zuppa Toscana, seeing as how I've never actually had it at Olive Garden myself. I only even knew about its existence through the wonderful world of Pinterest. 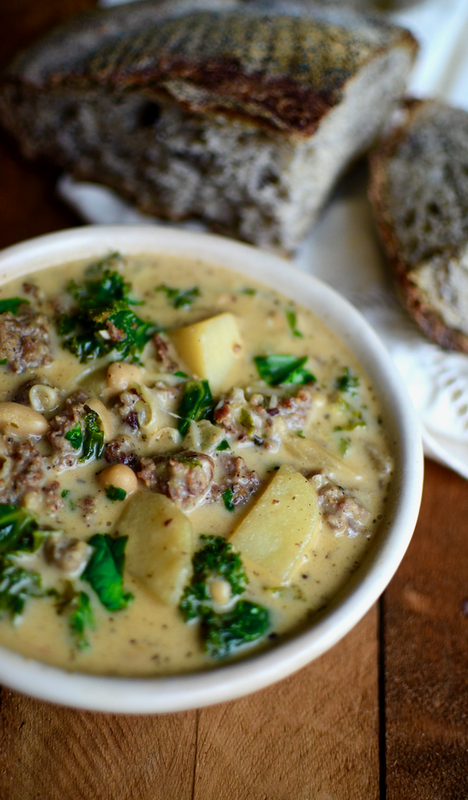 But, the idea of this soup captivated me, so I decided to try my hand at it. From Pinterest I have discovered that the original does not have any beans. I would consider this a defect of the original recipe. I chose cannellini beans because they sound like they're probably Italian (yes, I am the same person who brought you this chicken soup five years ago which I simply asserted was Tuscan without evidence). I sort of wish I had chosen a different type of bean though, because now I have had to suffer the annoyance of having to copy and paste the word "cannellini" every time I write it in this post because it's so impossible to spell that even my autocorrect doesn't know it. Not only that, but I also had been pronouncing it "canneli" for my whole life up until moments ago when I googled how to spell it. Anyway, long story short, I like cannellini beans in my soup. I have also seen that many Pinterest versions of the recipe add bacon. I don't know if this is something they do at Olive Garden or not, but I'm ashamed of myself that I didn't think of it myself. Sprinkle some into your bowl, by all means. I simply didn't have any on hand. Add the olive oil to a large pot over medium heat. 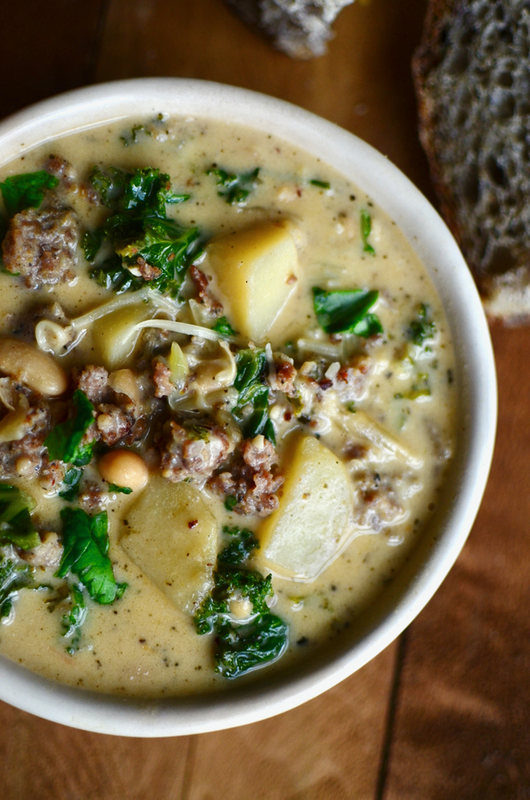 Add the sausage and chop it up with a wooden spoon (or your preferred utensil) as it cooks. Chop the onion and mince the garlic and add them to the sausage. Continue cooking until the sausage is browned and the onion is translucent. Chop up the potatoes and add them too. By now you may have some stuff sticking to the bottom of your pan. Now is the time to deglaze the pan (in other words, throw the wine in there and continue cooking until all the stuff comes off of the pan and into your soup). Add the chicken stock and flour (stirring in the flour and making sure there are no lumps), sage, and salt and pepper to taste. Simmer for about 15 minutes or until the potatoes are almost done. Now add the beans and kale and continue cooking until the kale and potatoes are done to your liking (maybe another 5-10 minutes). Add the heavy cream and parmesan cheese.